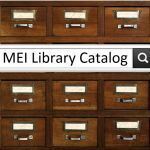 To access the catalog, simply click on the “MEI Library Catalog” button on the left side of the screen. Please note: the catalog records for the Middle school library are linked with the Secondary school so select “MEI Secondary Library” before you log in. After selecting “MEI Secondary Library” click the “Login” button on the top of the page. You can now login to your account using the same user name and password you use to log into school computers. If you are unable to login please let Mrs. Burritt know! Once you have accessed your account, use the “My Info” tab to view your personal information. This screen allows you to see the items you have out, renew items, check your fines, and view your holds. 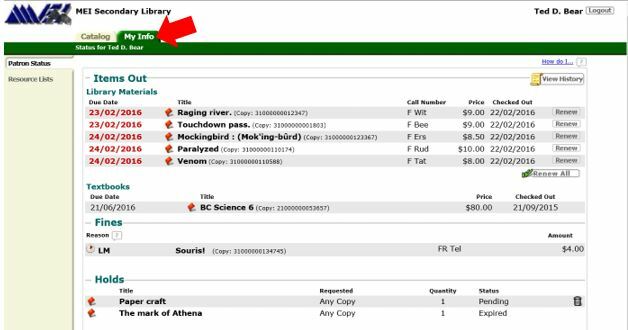 ***Items with the due date in RED under the “Items Out” section are overdue and will NOT show up in the “Fines” section until they have been returned or renewed. Fines are 25 cents per day per item so please check your account regularly to avoid fines! Please note: the “My Info” tab in Destiny Quest does not show all the information. To renew items, make sure you have selected the “My Info” tab. Select the “Renew” button beside the title of the item you wish to renew. If the item is on hold for someone else you will be unable to renew it. You can renew certain items up to 5 times so only press renew when necessary to avoid fines. It is very important that you return or renew any overdue items to avoid large fines! If you have lost a book please come to the library so we can mark it as lost so fines do not accumulate. To place a hold on a specific item, begin by searching in the catalog. Once you find the item you want, click on the title and you will see a “Hold It!” button on the top right of the screen, click on this and it will add the item as a “hold” to your account. Please make sure to come to the library to pick up your hold when the status says “Ready”. You will be given a message at the time the hold is placed that will let you know when that hold will expire or if it is unavailable. If the item is out when you press the Hold It button, the status will say “Pending”. Please check your account to see if the item you put on hold is ready to be picked up. When placing holds on books, please keep in mind that the catalog records for the Middle school library are linked with the Secondary school and the content of some Secondary school library books may not be suitable for students in the younger grades. Please do not place holds on Secondary Library fiction unless the Middle Library also has a copy. Another feature you will find useful is the “Resource Lists”. For example, if you are doing a research project, you can create a list to keep track of the books and websites you used. This will be helpful when you create your bibliography. You can view your lists by selecting the “Resource Lists” link on the left side of your screen and selecting the “View” button beside the list you want to see. You are also able to edit a list by selecting the icon with the pencil on it. To place items on your list, begin by looking them up in the catalog. Once you are viewing the item you want, choose the list you want it to be recorded in. There is a drop down menu beside the “Selected List:” for you to choose which list to add the item to. Once you have selected the list, click the “Add to this List” button. Students, please DO NOT make all your lists public. This is for teachers or librarians to share lists with the students. For example, I have added a “MID Fiction 2014-15″ and “MID Graphic novels 2014-15” etc. If you are working with a partner you can make your list public to share the information but MAKE SURE to delete it as soon as you are done with it! If you have any questions or want a “how to” in person, just let me know!